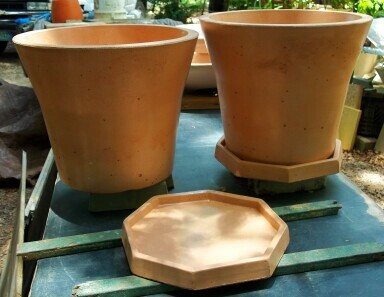 We currently mold flowerpots in 5, 10, and 15 gallon sizes. 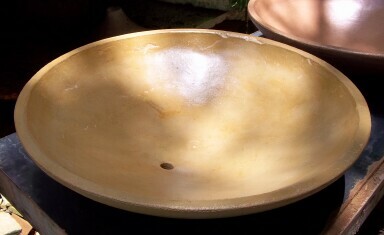 These are round with slightly flared sides, and saucers can be made if you wish. 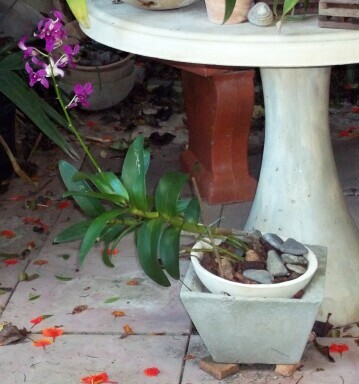 Colors and textures can match your brick and tile patios. 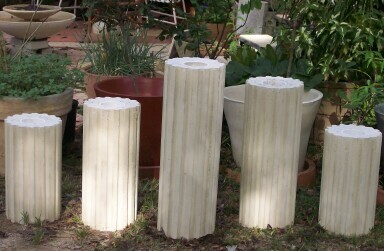 These molded pots can be found on our price list, and can also be hand painted on request. 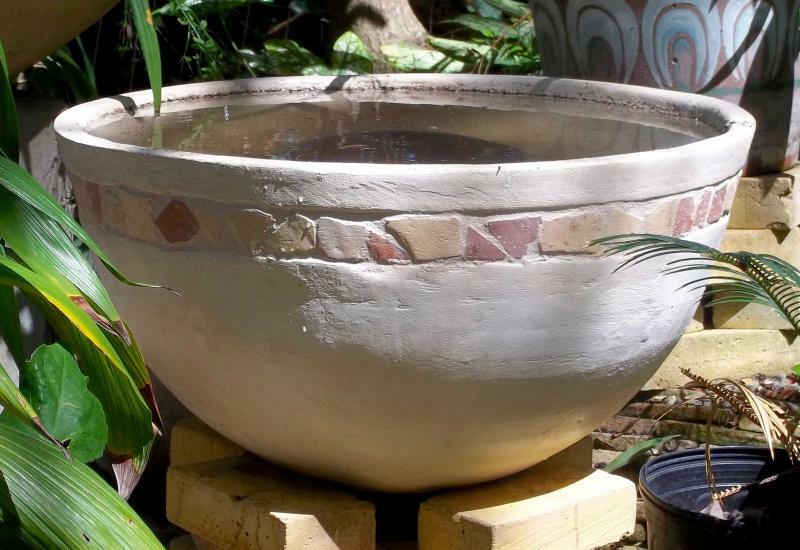 A new addition to our hand made pot line is the large, half-barrel planter. These measure 36" in diameter, and are 20" high. 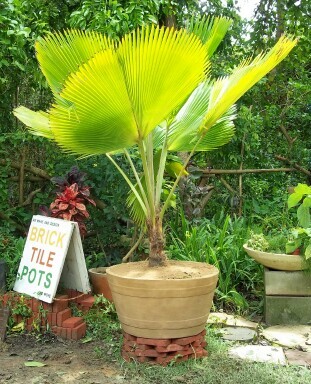 They hold 40 gallons, are big enough for palms and fruit trees, and are available made to order in many colors of your choice. 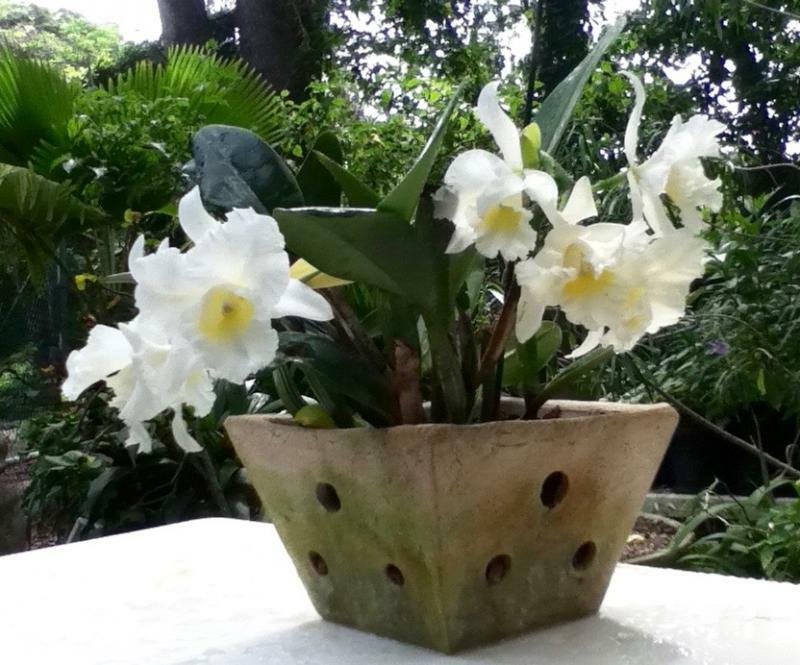 We make small orchid pots and small flower pots (1 to 2 gallon sizes) occasionally. These can be specially ordered, in your choice of colors, when time permits. St. Croix has a long history of import and export to and from Europe starting in the late 1600's. One of the most common shipping containers used for food was the olive jar, imported from Spain. These antique jars were hand made clay pottery, about 30 to 50 gallons in size. Lately they have been much in demand, but being very fragile, and expensive, it seems only fair to make similar eye-pleasing shapes out of ferro-cement. 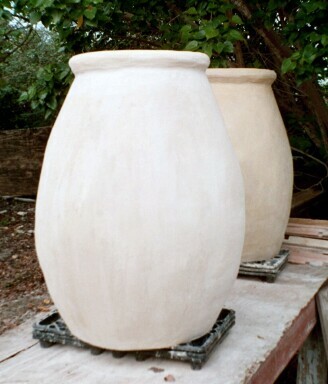 These hand made concrete pots and jars are very durable. An armature of galvanized wire is first constructed in a precise shape, and then plastered carefully with the proper concrete mix. 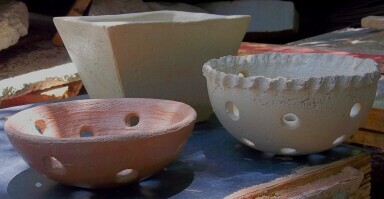 Color and texture are added as the pot is built, over the course of several weeks. There are no molds involved, so each project is unique. 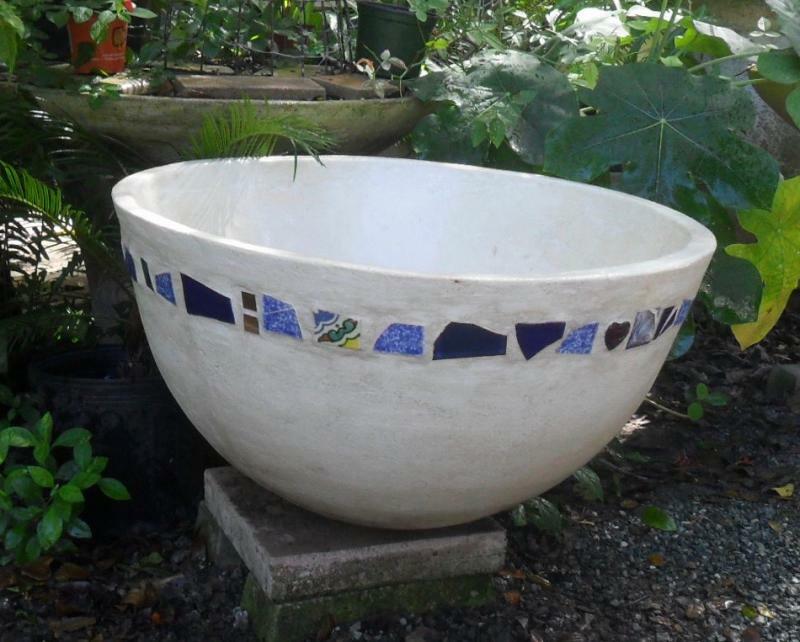 Pots can be made in sizes and textures to fit into your garden or patio decor; or the right pot can finish your great room. They are priced individually, and may be made to order. 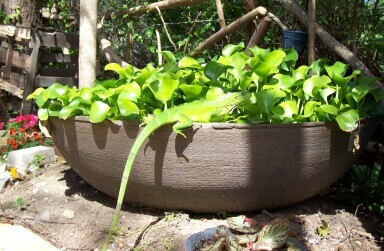 20 gallon deep, round bowls can be used as planters, or made into fountains. 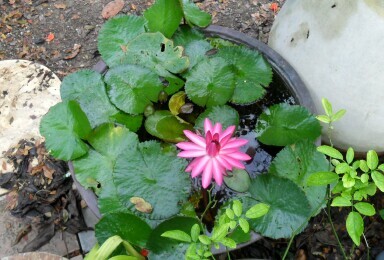 Most recent creations were inlaid with a band of Danish brick, and filled with water for water lilies. 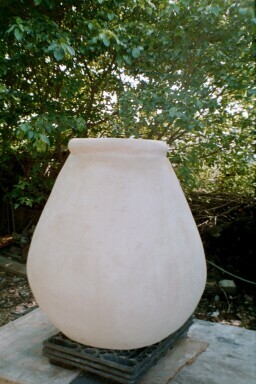 It is also possible to make large, even very large, pots in interesting shapes to use as gray water cisterns or holding tanks for water transfer. 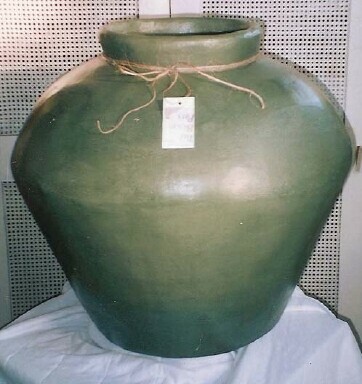 We were in need of a small cistern in our studio, and have made a 750 gallon pot shaped like a water pitcher. When we decide on the final color, we will post its picture. 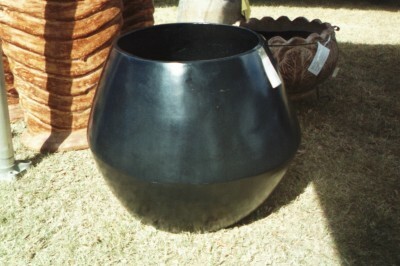 15 gallon round, shallow planters are made to order for use also as rock gardens and fountains. These also are available in your choice of colors and textures. 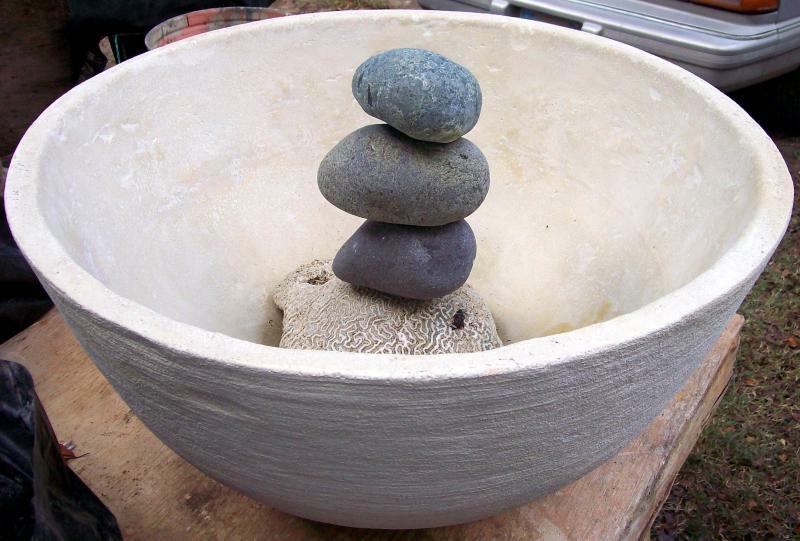 These shallow pots also make very interesting fountains, adding two more shapes for height, and rocks for accents. 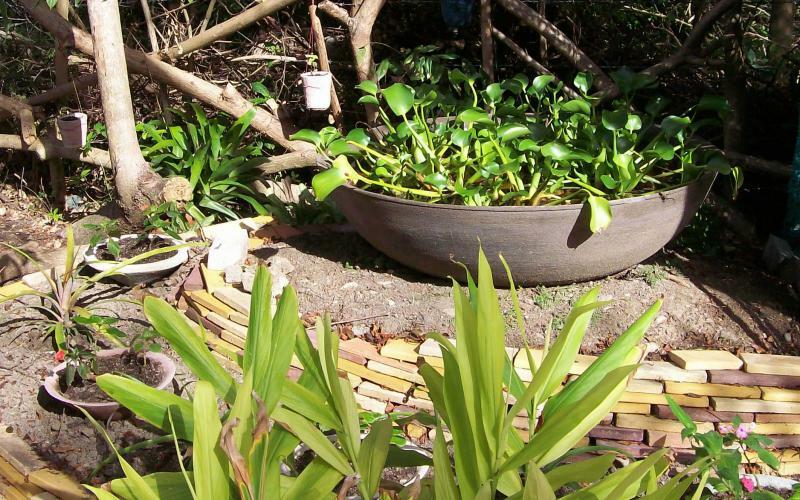 Large iron pots were used in plantation days when the sugar cane juice was boiled down into molasses. These pots, called coppers, have become rare, and our reproductions make excellent fish ponds, water gardens, and landscaping focal points. 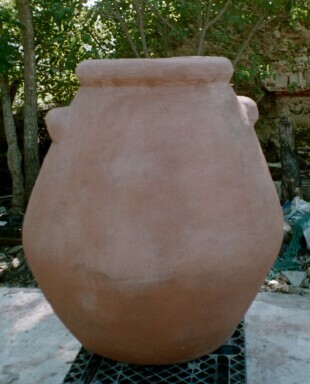 Large concrete, 4 ft., 60 gallon pot replicating the original copper pots used in the sugar production process here in the West Indies.